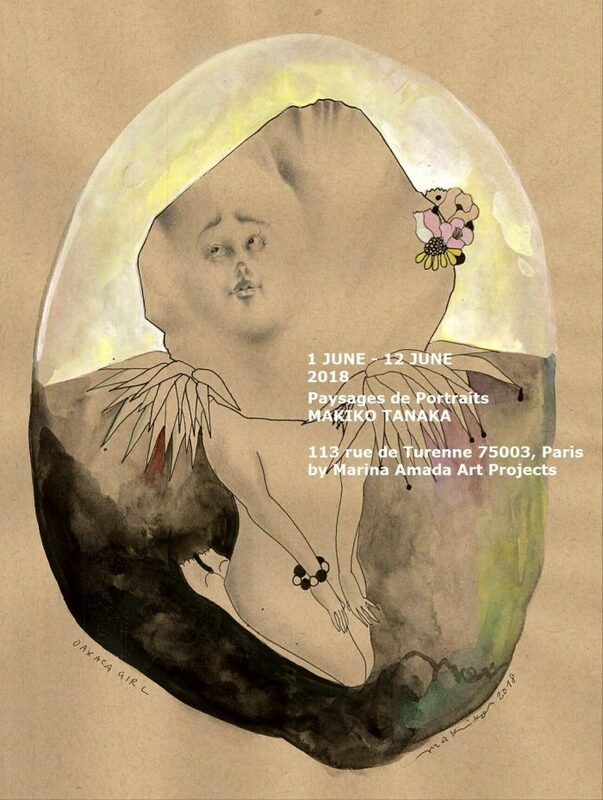 MARINA AMADA ART PROJECTS is proud to announce its inaugurating project with artist MAKIKO TANAKA in Paris, France. Makiko Tanaka has a ceaseless intrigue with the human faces. Face is both a concept and an object that are on the surface of something/someone. In the modern day society, the superficial representation of something or someone is often perceived negatively. Through her new series of works, “Paysages de Portraits” Makiko Tanaka challenges this view. The portraits of the characters in this exhibition represent the collective faces of the persons and the objects she has painted over the years in Japan and France, and reflect the contradictory phenomenon that cannot be described by a single-expression. The faces are the landscape of complex human experience that resonate. Makiko Tanaka is a Japanese artist born in 1975, arrived in Paris via the Japanese government grant from the Ministry of Cultural Affairs in 2013. Her distinctive surrealistic painting and large scale drawings have received critical acclaims over the years in the contemporary art field. She has recently expanded her creative outlets in the commercial sphere – leading the art direction for the Tokyo flagship store of the french pâtissier Pierre Hermé Paris Japon as well as creating an animated series for Shiseido. Most recently, she was in a group show at the 20th Domani exhibition at the National Art Center Tokyo in from Jan – March 2018. She has had solo shows in Tokyo with hpgrp Gallery, Shinjuku Takashimaya Art Gallery, Gallery M, Mizuho Oshiro Gallery, Gallery Momo and group shows at the Museum of Taro Okamoto in Japan, Matoom art space in Thailand, Sheraton Hotel in Taipei, Vanguard Gallery in Shanghai, Heyri Art Village in Korea and others. Her artist book ”La collection gastronomique” has been distributed by Colette Paris, Monte en l’air, NADiff du Champ Tokyo and others. She has been selected for the 12th Taro Okamoto Award for Contemporary Art.